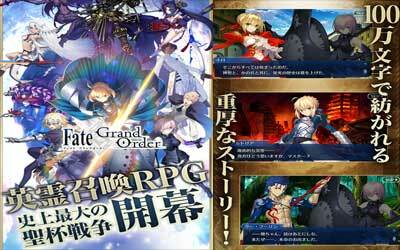 This is old version Fate/Grand Order 1.12.0 apk for Android, you can install it if you want to downgrade or install old app. It is top Role Playing apps from Aniplex Inc..
As master, you have right to give order and choose servant to do the job. In battle arena, you can pick one of three attack card that offers certain ability. Each of card make servant attack enemy and give energy. Once your servants are in full capacity, the ultimate attack is active and you are ready to use it. Player develops an arena to put five servants as main character then divide them into two groups. Combat team consists of two servants and the rest will be replacement. This game connect player around the world through internet so you can join with friends to create stages for battle. After several battles, master will gain experience and can manage to attack effectively without wasting too much energy and time. This game is very suitable for people whom like to enjoyable and thrilling atmosphere at game. You can install this game directly and Fate/Grand Order for android will be ready to play. A full-fledged RPG in smartphone can enjoy. The number of characters in up to 100 million characters than the story that you can enjoy the overwhelming volume!